When setting up an automation rule you can add conditions so that your action will only be triggered if the event happens in a specific scenario. Setting up a condition for your automation is easy. It only takes a few clicks to set it all up. 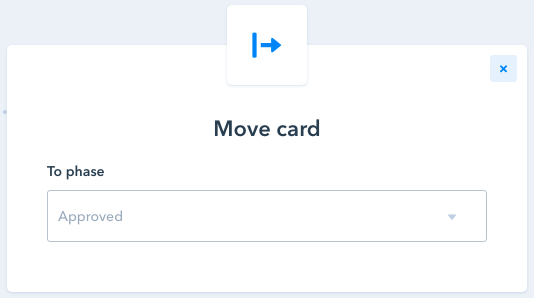 To exemplify how to add conditions to an automation we'll use a simple scenario: when a field is updated (with a certain value), the card will be moved to a specific phase). In our case, we have a horizontal radio field asking "Do you approve this purchase request?" in our purchase approval pipe with two possible answers: yes and no. When the answer is yes (and only then), we want the card to be automatically moved to the approved phase. 1. 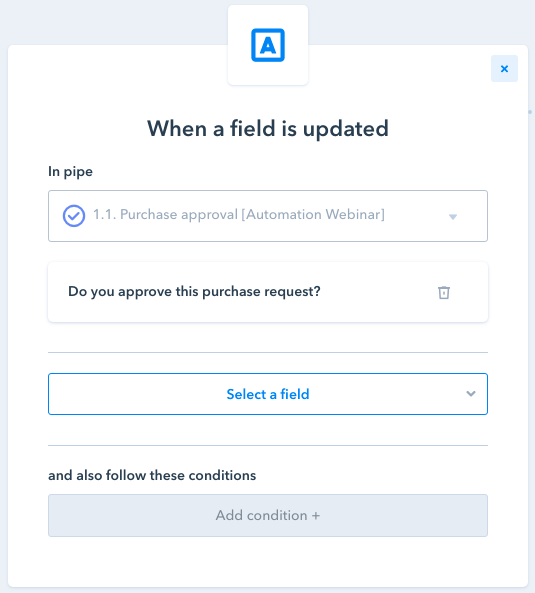 First we've selected the event "when a field is updated", then we selected the Purchase approval pipe and the "Do you approve this purchase request?" field in it. 2. Then, since we only want the automation to be triggered when the purchase request is approved, we've added the following condition: "do you approve this purchase request" - "is equal to" - "yes". Automation conditions can be used in many different situations, such as segmenting deals by value, selecting the phase in automation rules with alerts triggered and many other cases.